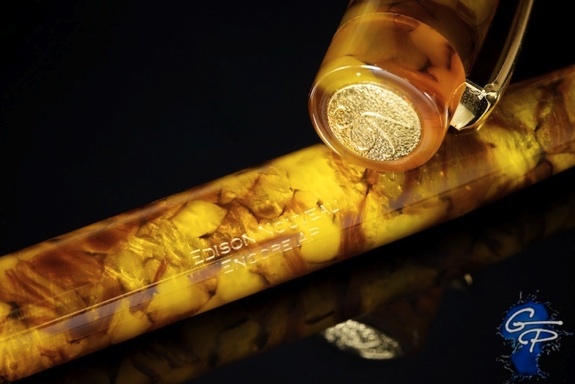 Edison Pen Co – Limited Edition Edison Nouveau Encore! Limited Edition Edison Nouveau Encore! We at Edison are proud to introduce our third Limited Edition collaboration pen with the Goulet Pen Company. This time we have taken the Encore, and created something special around it. 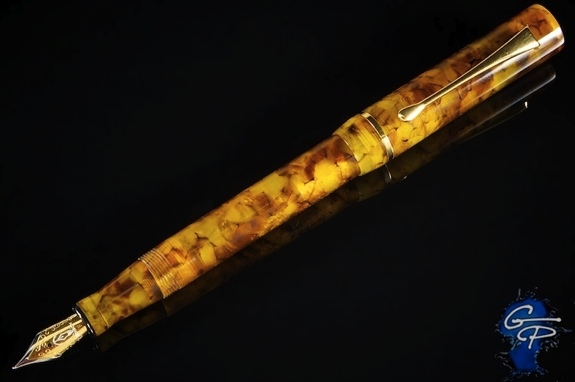 What makes this pen most special is the material used. This is Flecked Tortoise Acrylic. This is a material that I’ve wanted to use in a Production Pen or Limited Edition setting for a real long time, but there’s always been some obstacles to using it outside of the Signature Line until now. First, it’s rather expensive. This is an Italian-made resin that comes to me at a much higher cost. I couldn’t possibly do this as a Production Line pen without raising price. Next, my supplier of this material has never had enough inventory to allow me to get quantities where I could create more than about 10 pens at a time. I must have caught them at a good time, as I’ve been lucky enough to secure enough rods for a good sized Limited Edition. So I’m very happy to be able to offer a really special material that normally is only used in Signature Line pens (due to cost and availability) in a more affordable version! I honestly don’t want to sound like I’m trying to overly "sell" this material, but it’s one of my personal favorites! The pen in the photos has been my personal user at my desk since we first prototyped the Encore almost a year ago. I’m trusting the Goulet’s to take good care of this one, and get it back to me very soon! Honestly, if there were ever a chance to get a material that is usually too costly and hard to acquire at a Production price, this is the time! Also worthy of note is that this is the only Production version of the Encore with gold trim on the clip, centerband, and medallion. This pen will be pre-ordered within a buying period that is scheduled to end Friday, November 30. Granted that the materials arrive from overseas in a timely fashion, we are hoping to have the pen ready for shipping late December, perhaps early January. Timely manufacturing updates will occur as we progress, so there will be no surprises on the shipping date. Price is $185 with a steel nib. Beautiful! Does this have the regular screw in nib? Yes. Nibs are interchangeable with any Edison #5 nib. The pen is gorgeous! I know this sounds silly but I see that your converters come with silver trim and gold trim. 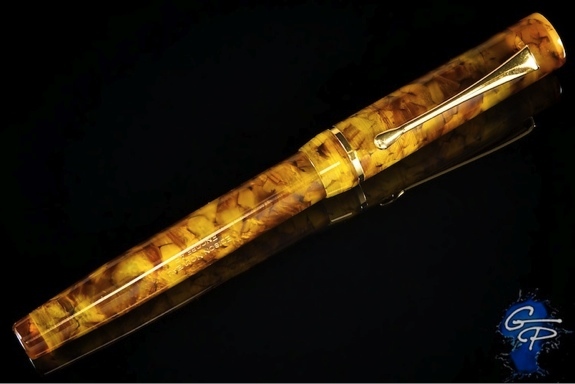 The photos on the Goulet Pen Co. site shows the pen with a silver trim converter and that just goes against my sense of color, based on the beautiful flecked tortoise resin. Would it be possible, when ordering, to be assured of a gold trim converter? Sorry, but the converters only come to me in a silver color. You may have seen a gold colored converter before, but I can’t get those anymore. If one uses it as an eyedropper, do you think the material inside will stain? I’d hate to ruin the translucency or color. I’ve made plenty of ED’s and Bulb Fillers from this material. I’ve never heard of interior staining. But I would recommend gentler inks in this situation.